FOR THE EVERLASTING GLORY OF ALPHA COMPLEX AND THE ARMED FORCES! The Armed Forces of Alpha Complex are THE THIN GREEN LINE, protecting Friend Computer from the vast hordes of Commie Mutant Traitors, renegade generals, rogue warbots and rabid squirrels. As a member of these elite forces, you will be issued with the latest in absurdly unreliable and destructive weaponry, given the most impressive rank titles that modern semantics can concoct, and sent out to die both horribly and repeatedly. This will not only be fun, but patriotic and heroic. The most elite of the elite may even be promoted into the elite elite Vulture Squadron Warriors, The Computer's chosen few! The slightly less elite will be shot, blown up, stabbed, run over, betrayed, waterboarded, bombed and quite possibly dishonourably disintegrated. THE THIN GREEN LINE. It's like Troubleshooting, only with bigger guns. 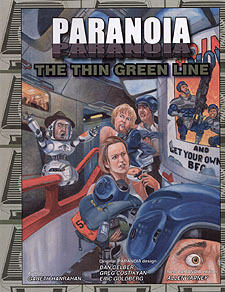 You need the PARANOIA roleplaying game to use this supplement.